My love of cherries has been no secret. The pale beauties in this drink come from the preserved cherries we made last summer. They feature the Queen Anne or Royal Anne cherries. The flavor of the Royal Anne cherry is very delicate. They might just be my favorite cherry. We preserved the Royal Anne cherries in a variety of sugary/boozy mixtures. One of which was a simple syrup with Creme de Cacao. It gave just a hint of chocolate flavor to the sweet cherries. I like chocolate martinis, but typically the clear variety. I much prefer it to the thick, creamy, syrupy versions. My chocolate martini consists of equal parts vanilla vodka and white creme de cacao. So for this drink, we added a hint of cherry. Shake all ingredients with ice, and pour into chilled or frosted martini glasses. Garnish with Creme de Cacao infused cherries. Of course this would be delicious with brandied cherries instead of the Creme de Cacao cherries. And any cherry brandy or cherry liqueur would work well in place of the cherry bourbon. This gives a nice light mix of cherry and chocolate without either flavor overpowering. 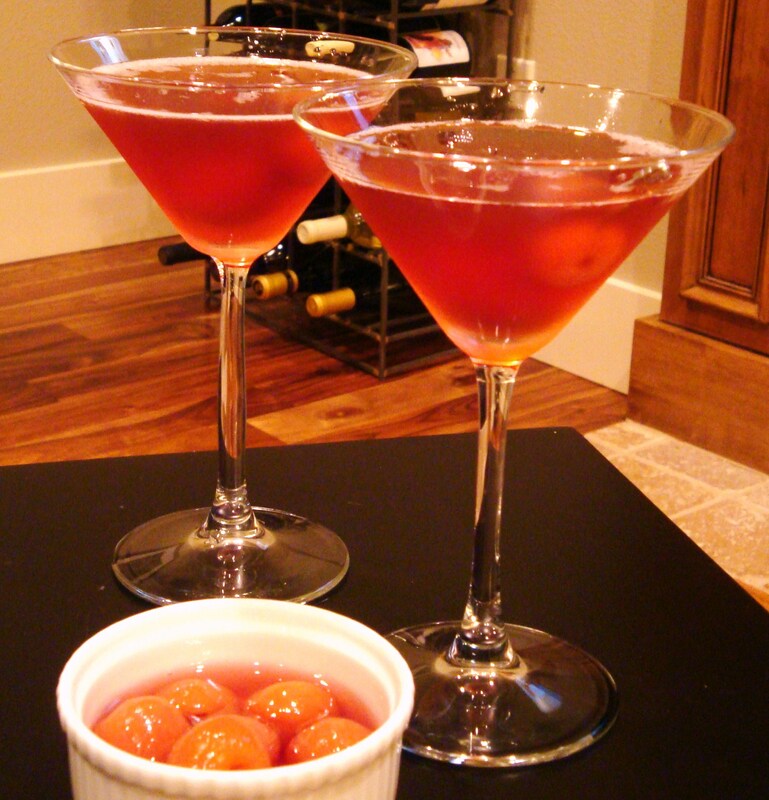 Categories: Cocktail, Drinks, Recipes | Tags: Bourbon, cherry, cocktail, creme de cacao, preserved cherries, recipe, vodka | Permalink. Now THAT’s a chocolate martini I can get behind. Totally hear ya on the creamy ones — gross. If I want my dessert in a glass, I’ll order a milkshake. Yes, it may be hard to find some of the ingredients this time of year if you don’t already have them. That’s actually why I started preserving cherries a few years ago.